It’s week 7 already, and we cannot believe how time is flying by. While we still have a good 3 months more of farming to go, being on the cusp of August is making us all realized what a fleeting season it is. 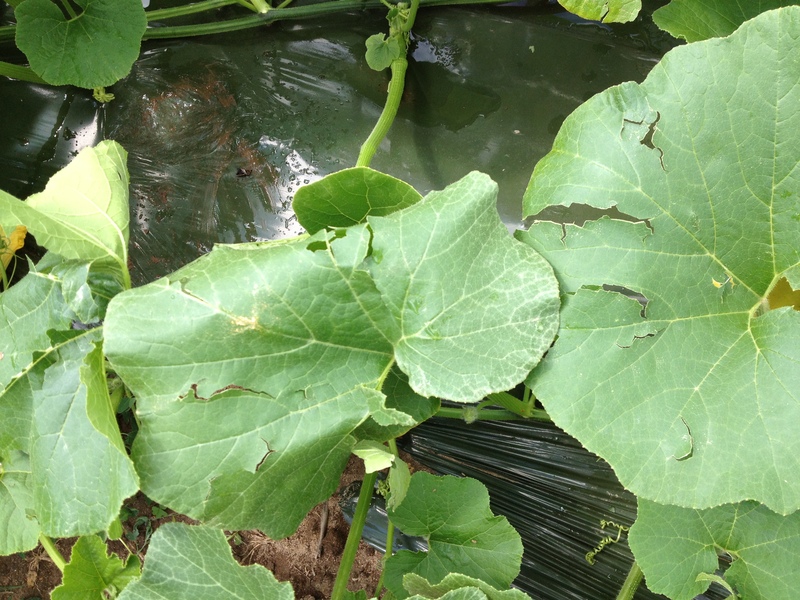 The poor little summer squash and zucchini suffered the most. Their soft thin skins can’t withstand the force of those little ice pellets, and we’re really sorry to say that many of your squash fruits this week are going to have little dents and dings on them. The taste won’t be affected in the least, but they are not winning any county fair beauty prizes this week! In better news, the corn should be ready for harvest in the next week or two, as well as tomatoes. 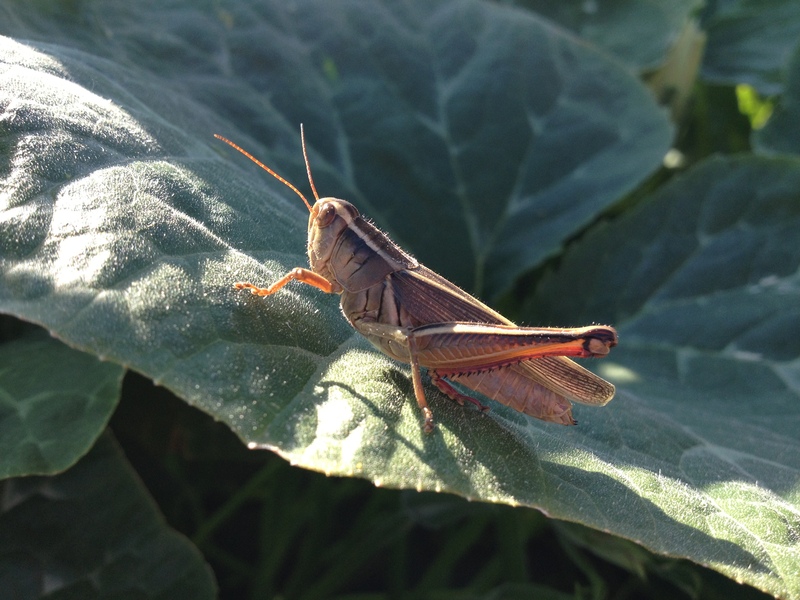 We know many of our members live for the corn and tomato boxes (we do, too) and all we need is a bit more warm weather and everything will go from the trickle of the present to the abundance of the very near future. The forecast has lows in the 50’s for most nights this week, so we might be delayed a little. Have no fear, there are so many fruits on the vines we’ll all be rolling in them soon! Friends! Don’t forget about the member party coming up on Sunday, September 8th. We would love to see all of you, and we would also love to have your RSVPs so we can prepare enough pizza dough and treats for the whole gang. It’s a great chance to meet your farmers, meet your farmer’s dogs and meet your farmer’s fields. We hope to see each and every one of you! 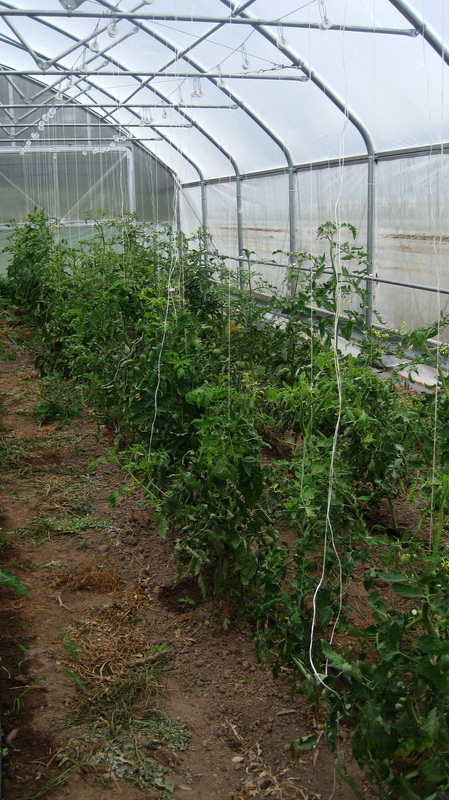 Tomatoes in the hoop house, looking good! 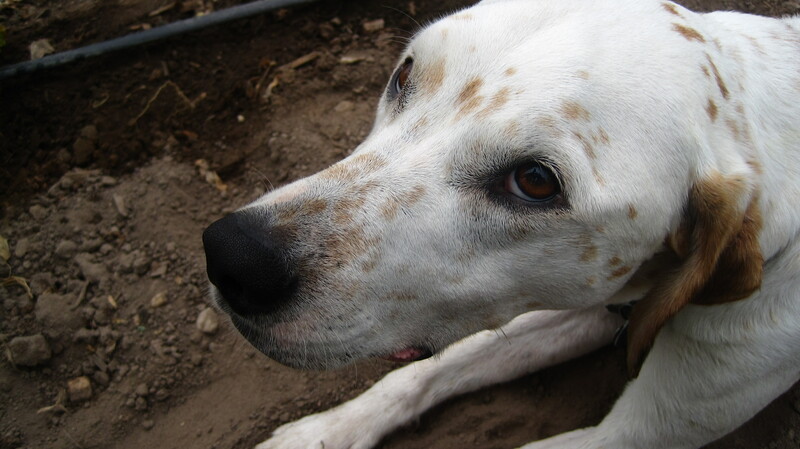 Egon, one of our farm doggies. He’s a little camera shy. What you find in the washing machine when you do your farmer’s laundry! 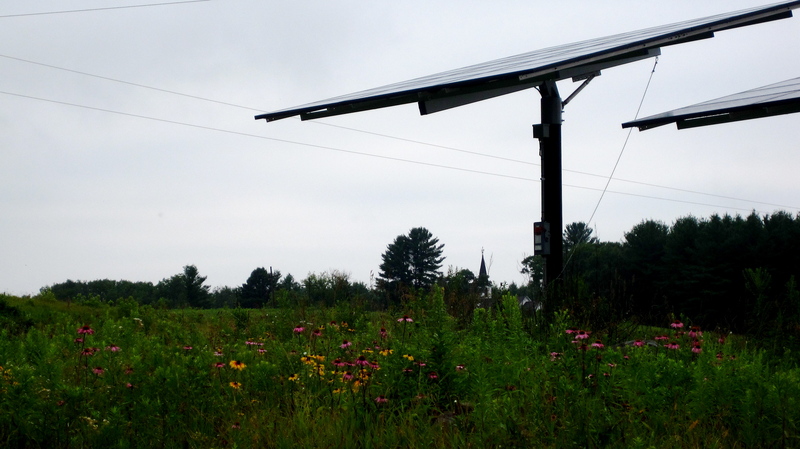 The solar panels in the wildflowers-we are still able to sell surplus back to the grid! Ready for the box? Here it is! Kale-Our favorite leafy green is back in the box! It did really well, overall, in the hail storm, and we’re happy to see it’s happy purple self back in the harvest totes. Broccoli-This broccoli is fantastic! It’s some of the best we’ve ever grown. 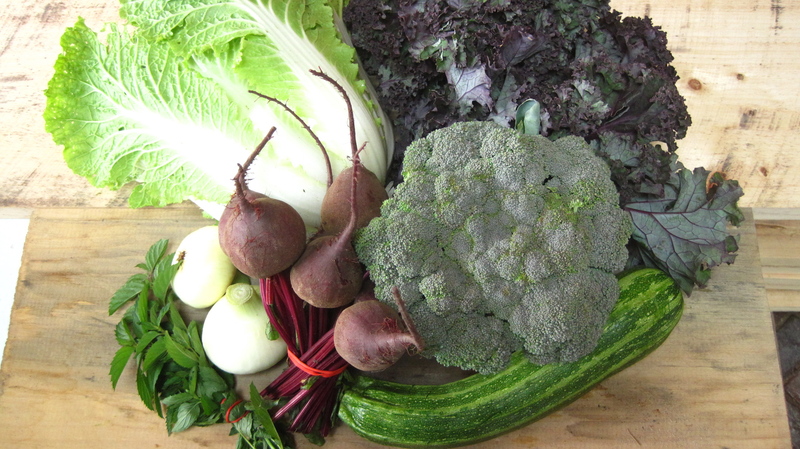 Did you know it won the Best Broccoli award at the Amery Heritage Farmer’s Market? That’s worth boasting about to your friends, and then turning into an awesome salad like the one below. Cabbage-We’ve sent an assortment of Napa and Early Jersey. We only like to pick what’s truly ready and right, and the entire Napa bed just isn’t ready, so we’re dividing the cabbage harvest between these two for this week. Beets-An exciting new component of the box this week. These beets are the perfect size, in my opinion: tender, delicate little jewels full of antioxidants, fiber, and anti-inflammatories. Their nutritional value is best preserved raw, so give them a try in the recipe below. If you like your beets cooked, minimize the cooking time as much as possible. Eggplant-These cuties are starting to come up, too. We’ve juggled them with beets for this week, but everyone will get their fair share once the warm weather returns and the plants go back into production mode. These are one of my favorite vegetables, and while I don’t think you can ever go wrong with a simple babaganoush, I’ve added another way to cook and eat them in the recipe section. Tomatoes-They’re coming! Full shares got the pick of the litter this week, but don’t worry, mediums and smalls, there’s lots coming around the bend. There’s a lovely green variety in the boxes this week called Emerald Evergreen-as the name suggests, it’s green AND it’s ripe and ready to eat. The green ones are often remarkably sweet, and Brandon’s pretty happy with this new addition to our green tomato line-up. Herbs-we’ve gone with the ol’ grab bag approach this week. Since we’ve only been at our new farm for a few months, the perennial herb bed is only a few months old as well. What that means for all of us is that there isn’t always enough of one herb to sustainably harvest it for everyone’s boxes, but personally I love the idea of a little surprise component! For those of you that got tarragon, check out this link for fun ideas on what to do with it. 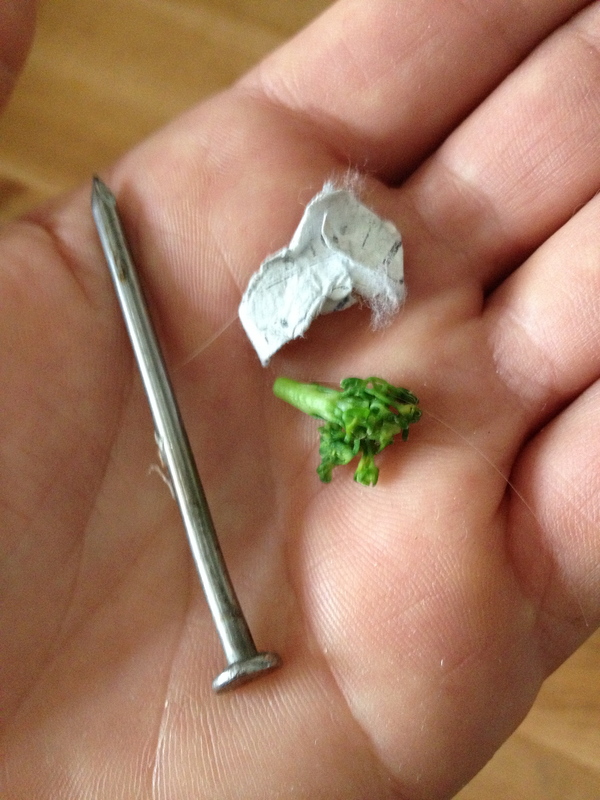 Cut broccoli florets from stems, and then cut into small (1/2-inch) pieces. Steam just until tender but still bright green, about 3 to 4 minutes. Rinse in a colander beneath cold running water. Drain well, and wrap in a clean tea towel to absorb excess water. Place broccoli florets in a large bowl with raisins and cashews. Whisk together the oils, vinegar, garlic, and cayenne. Drizzle over salad, and lightly toss. Sprinkle with toasted sesame seeds. Serve at room temperature or chilled. 1 tablespoon herbs, chopped-whatever you got in your box, it’ll taste great! 1 splash vinegar-we tend to use red or sherry, but anything you’ve got around is great. Peel the beets and shred, either by hand on a cheese grater or using a food processor. Cut the leaves off the kale and slice thinly. Toss the kale with olive oil, to coat, and then a splash of your favorite vinegar. Toss the beets and kale together and let sit on the counter for half an hour to an hour. Whenever you’re ready to eat, add the chopped herbs, add the cheese, and add more olive oil or salt if you think you need it. Done! Enjoy.